Notes: In the song "The 12 Days of Christmas," the traditional symbolism of "5 golden rings" was the Torah or the "5 books of Moses." When writing the poem "The 12 Days of Christmas: Re-vision", I saw them as the 5 sheaths (kosas) leading us to focus more on the inner senses (Christ's parable of the 5 wise virgins). While reading Barbara M. Fisher's Noble Numbers, Subtle Words about Charles Dumuth's "The Figure 5 in Gold", I realized how important the 5 outer senses are, and recalled the Ten Oxherd Drawings. The Zen Master Kakuan (12th century) seeing a former master depicting the final stage of enlightenment as an empty circle, added two more scenes "Returning to the Source" (oneness with Nature) and "The Sage Enters the Market Place" (oneness with humanity). That is, the enlightened sage is not far away on the mountain top enjoying his bliss of serenity, but actively engaged in everyday life, helping others to realize their true nature. I've seen Demuth's painting in the Metropolitan many times, but didn't know that it was inspired by Williams' poem "The Great Figure." After reading Williams' Autobiography, I learned that Demuth was his good friend during his college days. Here is an example of how the sharpened senses of the poet captured the audio sensation "gong clangs/siren howls/wheels rumbling" upon seeing the flash of "figure 5/in gold/on a red/fire truck" in his poem. That his friend, Demuth transformed Williams' poem into an equally evocative painting is doubly delightful. Exploration of our inner self as well as attention to our outer world through great art are both effective means to spiritual enlightenment. Below are the references I've traced in the original books at the Stanford Library. 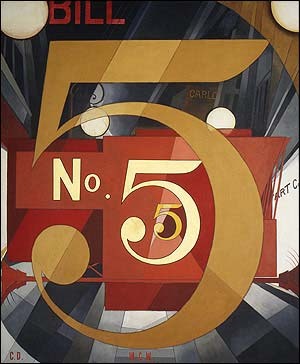 William Carlos Williams's "The Great Figure" (1921) prompted Charles Demuth's brilliant painting, I Saw the Figure Five in Gold (1928). Together, the painting and the poem illustrate the multidimensional properties of number in an aesthetic context. With its visual echoes of the number five a series of "fives" constant in design, yet diminishing in size as they recede inward, and enlarging outward almost past the picture plane the painting seems to penetrate mathematical space. Demuth places the poet's name, "BILL," above the horizontal of the largest numeral, and the letter abbreviation for "number" (No.) withing the curve of the five, graphically illuminating the relation of word to number. the cleanly executed graphics seem to honor abstract number itself, while the painting pays several kinds of tribute to its original stimulus a poem charged with energy, color, and resonance, yet spare in form, precise in content, rich in signification. The thirteen lines of Williams's poem launch a powerful image. "The Great Figure" closely conforms to Williams's famous definition of a poem as "a machine made of words." Each of its thirty-one movable parts that is, each individual word functions as a precsion-tooled component of the whole, while the "Great Figure" of the title introduces a wonderfully complex piece of verbal machinery. As a rhetorical "figure of speech," it announces the "howling" fire truck, the trope of the "unheeded" quintessential entity, and the poem, the figural "machine" itself. One of the more "clangorous" intonations of the Great Figure its red and gold coloration suggests the whore-of-Babylon splendor of the Church, so that on a subtle level, Williams's iconic fire-engine cartoons a religious emblem. The "figure 5" at the end of the third line contributes the abstract arithmetical sense of "figure," while the numeral itself stands apart as the poem's point of focus. Singled out typographically as a digit not a number word and underscored by terminal placement, the golden "5" is the object of the single sentence that constitutes the poem. It is the grammatical- mathematical object about which all the rest revolves. Reinforcing the centrality of the "5," Williams has chosen a numeral that occurs at the center or half-way point among the digits that compose the decimal system. On a metaphysical level, the moving but unmoved figure projects the notion of constancy in the midst of flux not a new idea, even according to Aristotle. "For in mathematics motion is a fiction, as the phrase goes, no mathematical entity being really moved." In the most graphic sense, then, the "5" exists as the unmoved/moving object and symbolic subject of this modernist poem. But it is the complex term "figure" that sounds a chord, as it were, simultaneously joining the verbal and visual arts to the mathematical like a C-major triad.